‘Still Waiting’ is the culmination of a Rights Based Review of Mental Health Services and Support for Children and Young People in Northern Ireland. The report provides a comprehensive overview of children and young people’s experiences and pathways to accessing mental health services or support. It looks at a broad range of services that young people may have accessed and considers these against a range of rights based standards. The report also examines service activity and budgeting data relating to mental health services in Northern Ireland and sets out a range of recommendations for improving services that are grounded in the evidence collected. There are 50 recommendations included in the report, which covers a range of aspects of mental health services and support. The overarching finding from the Review is the need for a system wide response to the challenges outlined. All agencies and sectors must work together, taking collective responsibility for taking the recommendations forward. For this reason in most cases, the report has not specified any one agency or department against individual recommendations. 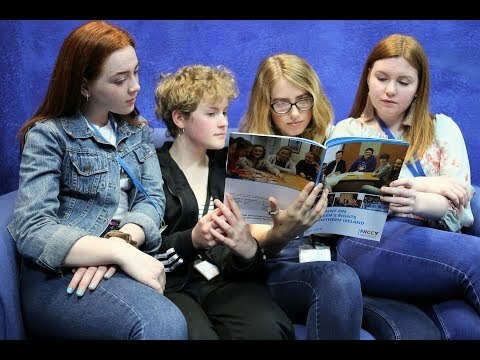 The recommendations cover a range of areas that include a focus on building mental health awareness and understanding, making it easier for young people to get the right help when and where they need it, supporting adults working with children and young people, and supporting young people with additional needs. You can view the main report, along with a Summary Report, Young People's Report and Easy Read Report here. NICCY is committed to monitoring the implementation of the recommendations in the report, and will engage with all relevant agencies to ensure improved outcomes for children and young people. NICCY will publish monitoring information on an annual basis. In January 2019 we provided a written submission to the Northern Ireland Affairs Committee Inquiry into Health Funding in Northern Ireland. The report was launched on 27th September 2018 at St Mary's University College, Belfast. NICCY produced an infographic as part of its main report - you can view it by clicking here. Children and young people’s experiences of mental health services and support formed a central part of the Review.